Dharma Mix | MV Nathan weaves his magic in "Traveller"
Kuala Lumpur, Malaysia -- There are many ways people show their gratitude, their philosophy and individual leanings toward social issues. Some do it through writing books and articles. Some go on to produce movies with their personal imprint on it. Some draw and some even dance through their way to express themselves. << MV Nathan weaves his magic in "Traveller: The Journey Continues..."
And then there is that popular platform - songs. What would happen if such a person uses this platform to marry his religious imprint with his inner self expression to showcase what he thinks of the world around him? Well, at the end of it, you have "Traveller: The Journey Continues..." by a very vintage MV Nathan. Nathan's "Traveller", his seventh album (the last was Addhana, 2012) consists of 11 tracks. How "Traveller" really stands out from his previous efforts is how soulful it really is and how much Nathan's inner ideals are laid out with such clarity and honesty. Most Buddhist albums are either tracked religiously, like adding musical rhythm to mundane chanting or praising sweet saccharin about our religious icons and beliefs. But to wrap Buddhist values and ideals around personalities, issues and even addressing troubling social matters and delivering them in catchy pop-centric composition require guts. The album actually delivers the story about the man himself: he reminisces with thanks the person for his Buddhist upbringing, why it is important not to look away at troubling sights, asking whether Buddhists have succumbed to spiritual materialism without them realizing it and so on. The man never forgets his humble beginnings. He thanked people who gave him friendship, love and support. In Buddhism this is called "katannu", gratitude. The first track expresses this earnestly as he paid homage to his teacher, the late Chief Ven K. Sri Dhammananda. The song "Feeling the absence" accentuates the vacuum of this Malaysian Buddhist monk since his demise in 2006. 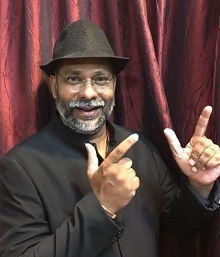 Best of all, he gets all his friends together to celebrate the launch of this album in a raucous, no holds bar revelry at the DBKL Auditorium tonight. The late Chief would have been proud of him. But that's just the starters, the appetizers. Once the regaled memories fade into the background, Nathan's soulfulness appears, like a thick, cold morning fog slowly eating up the shoreline. He delves into our subliminal crevasses reminding us that "It is our business too", asking "Why do you not care, why do you not feel, why we pretend not to see, or hear voices of the suffering, quoting scriptures as reason to stay away." As a lawyer himself, he has seen enough injustices. His call is clear: Be mindful, be Buddhist, practice metta all you want, fine. But don't look away. He knows that line of questioning is raw and tough. Not many people can take it. What more Buddhists. So that's why he softened the pinch with his next number (taken from a Dharma talk by Thich Nhat Hahn) simply called "Peace". To have the stomach not to look away is simply to be "at peace with our bodies and mind". Here's where Nathan magic works, because he calls peace "a living tradition". We have to live it, he says. "Let us pray that we ourselves cease to be the cause of suffering to each other," he sings. "With humility, with awareness of the existence of life, and the suffering that are going on around us, let us practice the establishment of peace in our hearts and on earth," he rhythmically implores. That... is how you learn not look away - from other people's pain and agony, from the suffocating pollution that we impose upon our planet, from the false sense of achievement of glorifying our material wants while trampling on nature and natural resources. We face our ugly self centreness by having a self centred core of peace and mindfulness. But that's not all. Believe it or not, too much religion can be corrupting. Yeah, how so? In "Nama and Rupa" (Mind and Body), Nathan observes that "Everyone's building a temple ... everyone's wanting a title..., the bigger the structure, the better the Dharma." And yet, "There never was a single temple... a single image, that the Tatagatha wanted built in his name or his Dharma." In short, Nathan asks when did we get to become so spiritually materialistic? If we cannot answer that right away, then perhaps rewinding the song and playing it back a few times can help us to see a little more. The answer indeed, is right at the end of this track. At the end of this endeavor, what magic did MV Nathan conjure in "Traveller"? Not exactly a classic, but certainly one of the most honest and truthful expression from a practicing Buddhist song writer and singer. In "Traveller" we get to hear Nathan wear his ideals and values track to track, through and through. Get the "Traveller: The Journey Continues..." CD from major Buddhist centres. Contact your centre for more information. "Traveller: The Journey Continues..." was launched at the Dewan Bandaraya Kuala Lumpur (DBKL) on July 15, 2017. A concert called "Traveller: MV Nathan and friends" was organized to accompany the launch. A capacity crowd of more than 500 watched the performances presented by MV Nathan (and family), Band AkashA, Messengers of Dharma (MOD), Big Chips Choir, The Metronome'z and capped off with the mad cap duo of Seri Panggung Bibik Entertainment. 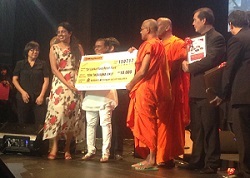 The concert also did its bit by raising funds for Sri Lanka Flood Relief, BMSM Kajang Sunday Dhamma School and the construction of a 20,000 sq ft Pusat Buddhis Dhammaduta Malaysia, the largest Buddhist centre in the Administrative Capital of Putrajaya.